You can be for or against American foreign policy, but our soldiers are our soldiers and they're doing our elected officials' bidding in Iraq, Afghanistan and a number of other places. Helping them deal with the reality of dangerous fighting, extended tours and a generally anti-U.S. world falls to us U.S. citizens, then, but what to do? 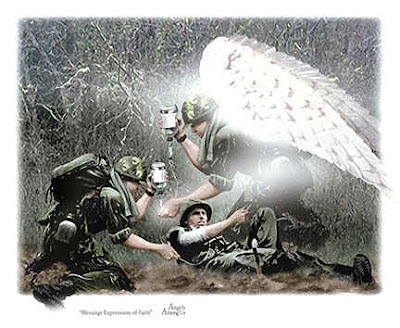 One great way to help them is to join Soldier's Angels, an organization that links up people who care about our soldiers with the soldiers themselves. Join the group and they'll match you up with someone who's likely stationed in Iraq or Afghanistan; from there they give you lots of tips for how to help your soldier, from writing letters, to sending snacks they crave while overseas, to helping them deal with their family's daily life in absentia. If you're searching for a way to help our soldiers, believe me, this is the way to go. Cindy Sheehan recently complained that 1% of America is fighting this war, so if you don't want her words to be true, sign up here. My soldier and his platoon are about to receive more snacks than they've ever seen in their lives, along with ballistic-grade Oakley sunglasses for the looooong patrols they go out on regularly. Thanks to everyone who contributed!! !